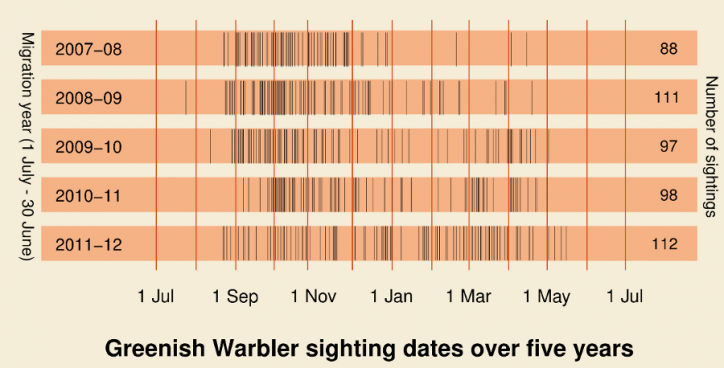 Here we present the year-wise arrival pattern of one of our most observed species – the Greenish Warbler. As in our earlier illustrations, each sighting is shown as a vertical black line. The above graphic shows that Greenish Warblers start their southward migration into the Indian subcontinent in late August. They stay on till early summer and by May almost all of them return to their breeding grounds in the Himalayas and beyond. To look at all the Greenish Warbler sightings on MigrantWatch please click here. You may also want to look at our series on Phylloscopus warblers here. Every year, as the south-west monsoon fades across our land, a sense of restlessness and upheaval brews in the high Himalayas. The grey skies of August transform into the clear blues of September and a developing chill marks the air. The landscape and trees are gathering the colours of autumn; winter is not far. Then, in the high mountains, in ravines with willow and rhododendron, in lichen-encrusted forests of fir and birch, millions of little birds prepare themselves for a great journey. The birds are so small that they can nestle snugly in the palm of your hand, or even fit into a loosely closed fist. They are most unassuming and drab, dressed in pale greens and humble olives, or in dull browns with scarcely a dash of yellow or orange, sometimes dabbed with pale wing-bars and stripes. They merge so well with the leaves that were they not so active and restless—flitting their wings and calling regularly to announce their presence—it would be hard to even spot them. And yet these wispy little birds, weighing around ten grams, can stake claim to great achievement. Every year, millions of them migrate hundreds to thousands of kilometres—in a matter of days even—flying south from the high Himalaya, the Caucasus and mountains of Central Asia to winter in the foothills, plains, plateaus, and hill ranges across India. And here, after a lull of many months, when the trees and shrubs are a-flutter with lively chirps and twittering song, we know that the leaf warblers are back. The leaf warblers, as one may guess, have a close association with the foliage of shrubs and trees where they restlessly search for their insect prey. Their restlessness is heightened in the days that precede migration. The birds feed in the foliage, as if in a frenzy, to load up for their journey a crucial stock of fuel: a few grams of fat. That hundreds to thousands of kilometres can be efficiently travelled on a few grams of fat is one of the primal wonders of bird migration. Burning fat is more efficient than burning sugars or proteins, producing as a by-product water, another key need for those long hours on the wing. Although many birds, including small ones like warblers, fly non-stop between their breeding and wintering grounds, the leaf warblers may make brief stop-overs en route. Thus warblers heading to the southern tip of India may be recorded on passage at sites in northern India or the Deccan in August-September and then again in April-May during the return journey. In southern India, the most ubiquitous of the leaf warblers is the Greenish Warbler. This species has three forms that differ slightly in plumage and call, which ornithologists sometimes separate into three species. It is found in a range of habitats from urban gardens and plantations to tropical forests, preferring the canopy of trees. When these warblers leave the sub-tropical and temperate forests of the Himalaya or the mountains beyond for the tropical deciduous and evergreen forests of the south, it is not just the tree species and the habitat they use that changes. They make a fundamental change in their lifestyle. Up north, these warblers live and breed in pairs during the summer, each pair defending its territory from other pairs for its valuable trove of insect food. Yet, when they come south for the winter, the males and females separate—each individual maintains its own territory. A female sings and defends a territory from other members of its species, just as a male does. Following the monsoon rains, insect prey are rich enough in the foliage to attract the warblers, but scarce enough to warrant staking out a territory to defend it from the warbler multitude. The territories the birds defend are not large. A single hectare of tropical forest may pack two to four birds holding territories. By marking individuals with numbered and coloured rings on their feet, ornithologists have shown how the same individuals return to the very same quarter hectare of forest after their long journey every year—a feat of fidelity and orientation that one cannot help appreciating in so small a bird. When the warblers arrive in our forests and gardens in September and October, they arrive singing. These are territorial songs staking claim to their all-important grove of trees or little segment of forest. During the first few weeks, the trees are busy with songs and territorial skirmishes as some warblers settle down in their winter turf and others are chased out of it. The songs then give way to simpler, short call notes serving to merely announce their presence (a boon to birdwatchers to detect and identify each species). Then, over a relatively quiet period, the warblers moult into a new set of feathers, as if to greet the new year. As April arrives carrying the promise of Himalayan spring, the relentless forces of nature and instinct turn the birds northward. Once more, the birds feed briskly to load up on fat. There is a flurry of song, as if in preparation for the territorial battles to be waged shortly on their breeding grounds. And then, one day, the tree where you have watched the warbler for several months is silent, and the bird is gone again. And yet, when the warbler departs, it leaves behind a new awareness. An awareness, stirring deep wonder and strangely uplifting, that a tree in one’s garden may be linked to a specific, even if unknown, corner of the Himalaya by one individual bird. A renewed sensibility that the garden and that Himalayan corner, and a range of stop-over sites along the warbler’s route are all needed to keep alive this tiny linker of worlds. The warbler’s journey then seems a brave voyage of survival and connectedness, surmounting artificial boundaries and national differences in a way that transcends our best-intentioned bilateral efforts at cooperation. Softly and unobtrusively, as it has done for millenia, the little warbler continues to tie us to other lands and peoples and nations far away. T. R. Shankar Raman is with the Nature Conservation Foundation.